Gifts to the State can present interesting challenges, particularly if they are alive and quite possibly kicking. For whom, ultimately, is the gift intended? And, who is responsible for looking after the gift and ensuring that it delivers the anticipated benefits? This can be particularly problematic when, as was the case with Stonehenge in 1915, the gift is a sizeable, not to mention immoveable, one. However, on other occasions these gifts have been rather more transportable, and one such is commemorated in a lavish book in the British Library entitled, “The National Stud. A Gift to the State. A Memorial of it, Compiled, Edited and Decorated by George A. Fothergill, with Portraits by Lynwood Palmer and the Editor, 1916”. It is an “Edition de Luxe” of which only 325 copies were privately published, and it was “printed on handmade unbleached Arnold linen fibre with private watermark” for Colonel W. Hall Walker, M.P. It is essentially a pedigree book containing paintings and drawings of the horses in and out of training which belonged to Colonel Walker and were bred by him. 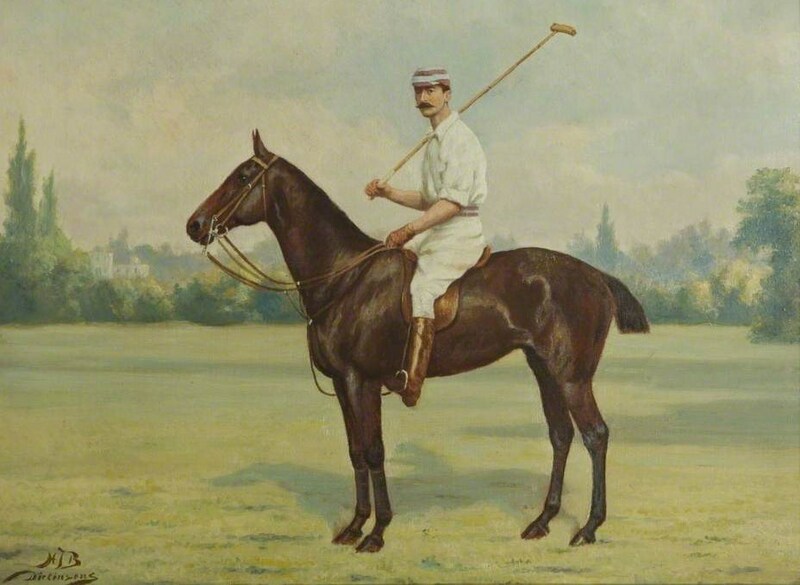 William Hall Walker on 'The Flirt' by H J B Dickinson, c.1880. Image: Public Catalogue Foundation. In fact, it was in the autumn of 1915 that Colonel Walker offered his bloodstock at Tully in County Kildare to the British Government for the purpose of founding a National Stud. It was a significant offer; 6 stallions, 43 brood mares, 10 two-year olds, 19 yearlings and more than 300 head of pure and half-bred short-horn cattle. 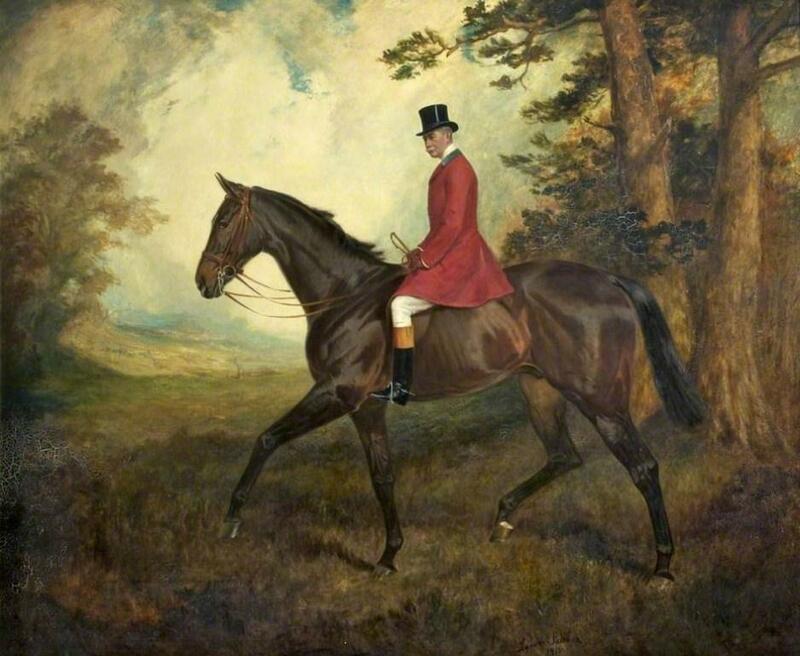 Moreover Walker’s stud farm was renowned throughout the world of racing; Tully-bred horses had won not only the Derby, but also the One Thousand Guineas, the St. Leger and the Ascot Gold Cup. Walker himself was a curious mix of the orthodox and the quirky. He was the younger son of Sir Andrew Barclay Walker, 1st Baronet, a wealthy brewer born in Ayrshire who expanded the family business to England and moved to live in Gateacre, Liverpool. Educated at Harrow, Walker entered the family business and in 1900 was elected as Conservative Member of Parliament for Widnes, serving in this role until he resigned on 18 August 1919. Rather less predictably, he was a lifelong believer in astrology, insisting that the date and time of birth were crucial in determining the destinies of his horses, for breeding and racing racehorses were his particular passions. He employed an astrologer to draw up charts of all his foals and to predict their prospects on the racecourse. And he fired his trainers when their charges did not deliver what the astrologer had predicted. It fell to the Civil Service, in this case the Board of Agriculture, to negotiate the terms under which this proposed gift was to be accepted and to make the necessary arrangements for its future management. Although the bloodstock was donated to the British State, the land and buildings which they and their keepers occupied were not. After some discussion as to the exact acreage of the land, it was finally purchased by the British Government for £47,625 (equivalent to £3m-£4m in current cash terms, depending upon the calculator used). The first Director of the National Stud appointed by the Board of Agriculture was Captain Henry Greer, a Steward of the Jockey Club and a member of the Irish Turf Club, who had offered to perform the role free of charge as his contribution to the war effort. Reservations were expressed by officials from the start as to whether the Government should be involved in such an undertaking. The original stated purpose of the National Stud was to lead a breeding programme to supply the British Army with high quality lightweight cavalry horses for use in military campaigns. However, the rise of mechanised transport during the First World War made the value of such a programme questionable. Nevertheless, correspondence from November 1939 in the official records indicates that when the closing of the Stud was discussed in 1919, “the Army Council desired to see the Tully Stud retained on the grounds that ….as far as could be foreseen, cavalry and horse transport would continue to be indispensable in modern warfare”. Furthermore, in the beginning at least, the Stud did make money. In 1922 it was stated that, “During the five years in which the National Stud has been in existence … the trading profit has increased from year to year and has aggregated £22,777”. Nevertheless, over time, the focus of the Stud switched from the breeding of cavalry horses to the general improvement of the Thoroughbred breed, and its profitability fluctuated. Colonel Hall Walker was raised to the peerage as Baron Wavertree, of Delamere in the County of Chester on 27 October 1919 in recognition of his gift. Colonel William Hall Walker on 'Buttercup' by James Lynwood Palmer, 1913. Image: Public Catalogue Foundation. However, it was not until 1943, owing to war-time conditions, that the British Government sold Tully to the Irish Government, who established their own National Stud on the site, which operates there to this day. The bloodstock was then moved temporarily to the Sandley Stud at Gillingham in Dorset. After the Second World War the Stud’s operations were expanded with the purchase of a stud at West Grinstead in Sussex. The Stud remained the responsibility of the Ministry of Agriculture and Fisheries until 1963, when its operation and control were transferred to the newly established Horse Race Betting Levy Board, and its operations were moved to five hundred acres at Newmarket, which had been leased from the Jockey Club. From that time onwards the Government stopped contributing to the annual expenditure of the Stud, which in future maintained its own identity and accounts and became self-supporting. The Levy Board ran the National Stud until it was purchased by The Jockey Club in 2008. It is now a private company and tours of its facilities are available to the general public, including perhaps a visit to the coffee shop, which is named Wavertree’s after the original founder of the Stud.